Losing my iPhone 4 sucked, but it was a great excuse to pick up a new phone. 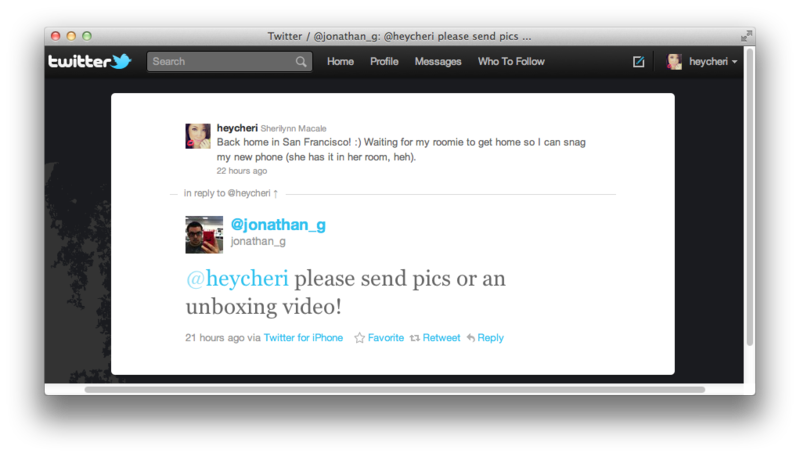 After hearing that the iPhone 4S would take anywhere from 3 to 4 weeks to arrive, however, I just couldn’t wait anymore. The customer service rep handling my order estimated the Samsung Galaxy SII’s arrival time at less than half the amount I’d spend kicking dirt for an iPhone 4S, so I placed the order blindly. One week later, my new Android phone was here. The first thing I noticed was how ridiculously light the thing was. I’ve never seen any Samsung Galaxy SII commercials or advertisements (and if I have, I’ve conveniently tuned them out), so handling the device for the first time felt completely foreign to me. For some reason, it struck me as “cheaper” in a bad way. Does lighter and portable really equal lower quality? Probably not, but I was so used to the iPhone’s heavier body that a direct comparison was unavoidable. I would have taken pictures, but was too excited to stop and photograph the unboxing — despite one equally-excited Twitter follower’s plea. Fortunately, I have been keeping track of my impressions as I’ve continued to toy with my new mobile device. Below you’ll find a general opinion on what the transition from an Apple iPhone 4 to a Samsung Galaxy SII equipped with the Android OS has been like for me. Does every Samsung Galaxy SII come with this sticker? Or is a different saying on each one? Regardless, I find the product packaging interesting and surprisingly humane. 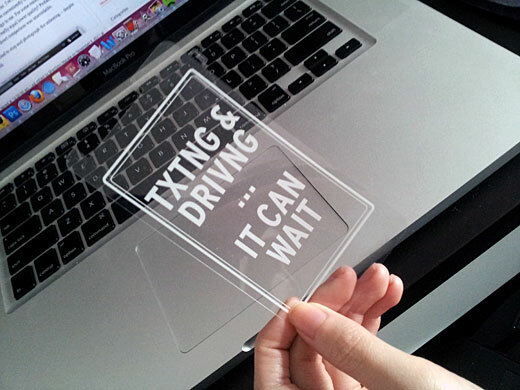 Either that, or it’s a mass-shipped subliminal message reminding everyone to pull their nose out of their phone while driving. I also had to assemble the battery and phone myself, a task I actually found to be pretty fun, despite having to actually work to figure something out. iPhones require literally zero physical assembly, leaving its guts a secret to most screwdriver-challenged mobile users. With the SII, the way it’s packaged essentially teaches you how to reach the customizable additional memory compartment, as well as the easily switchable sim card slot, giving you a better understanding of how the device works. After the painless puzzle-piece assembly, I weighed the phone from hand to hand, surprised at how fragile it felt. 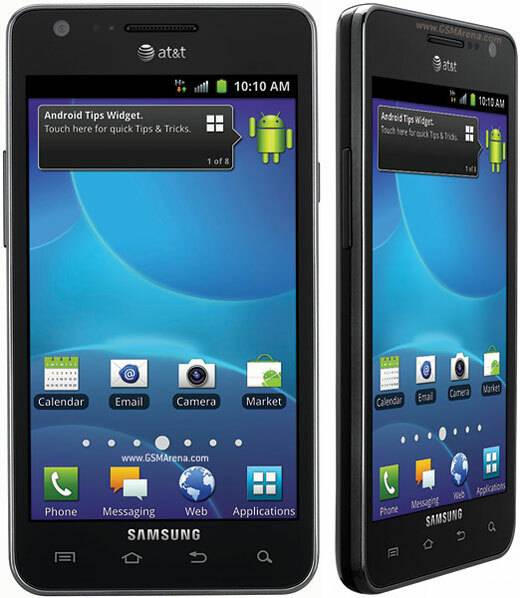 When it comes to weight, the Samsung Galaxy SII is 0.7 ounces lighter than the Apple iPhone 4, coming in at 4.1 oz versus Apple’s 4.8 oz. “Almost an ounce” difference may not sound like much, but having used an iPhone 4 sans cover for quite a while now, the difference is interesting. It threw me off for the first day, but after religiously carrying this thing around for more than 24 hours, I’ve found its weight to be enjoyable. Plus, that screen is just impossibly huge! Compared to an iPhone 4, the Galaxy SII measures at 0.8 inches larger. That’s Apple’s 3.5″ versus Samsung’s 4.3″. Also, these pictures hardly do the exterior any justice. Not only is the phone easy to disassemble and piece back together, but unlike the iPhone 4, it is not completely covered in fingerprint-loving glass. 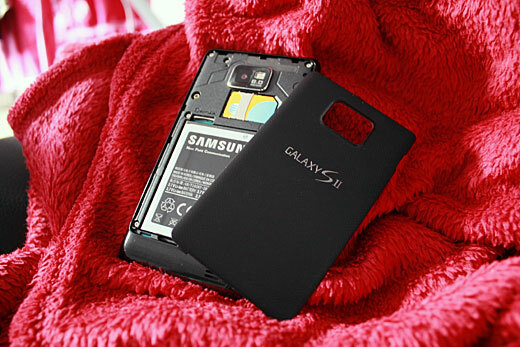 Instead, the Samsung Galaxy SII has an exoskeleton comprised of a mix between matte and low-gloss material. This makes the phone lighter and “cleaner feeling” as well. With my iPhone 4, I was constantly swiping it clear with a lens cloth as it tended to accumulate and display grime rather easily. 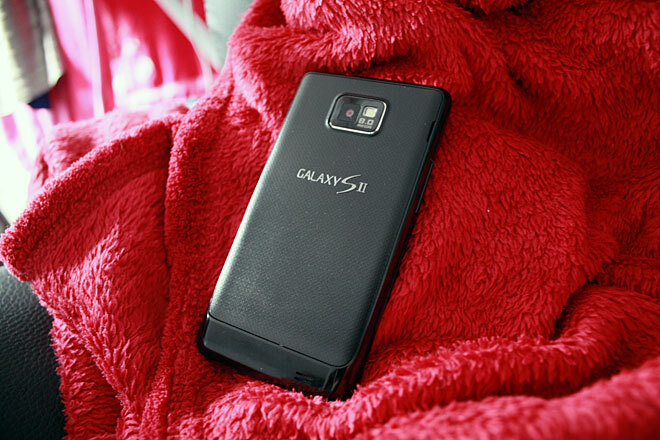 With the Galaxy SII, it actually makes handling my phone feel less “gross”. Less grime and body oils actually makes me want to play with the device more. Not to mention, dropping it actually feels a little safer (not that I’d ever drop it on purpose). 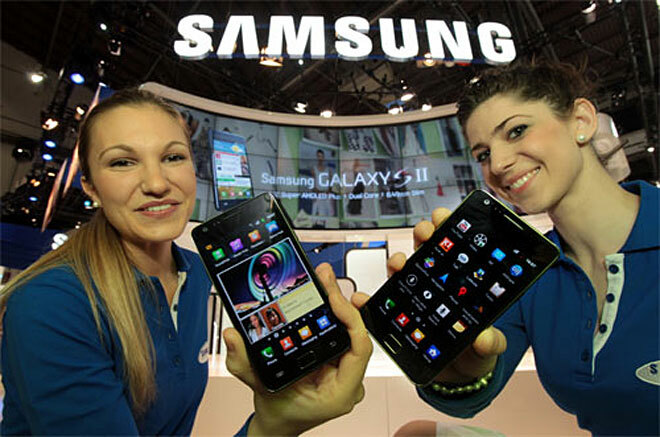 Similar to the iPhone 4, the Galaxy SII comes equipped with a front-facing camera as well as a rear facing camera with flash. The Galaxy SII, however, shoots with an 8MP rear camera (which I used to capture this image), while the iPhone 4 only shoots with 5MP. Even the front-facing camera on the SII is a step ahead of the iPhone 4 with a 2MP camera, while its Apple counterpart only has basic Video Graphics Array (VGA) capabilities. 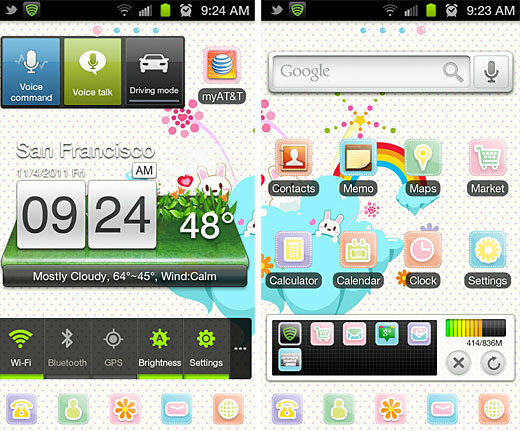 Transitioning from iOS software to Android’s more open-source and customization-friendly interface felt very odd. With an iPhone 4, again, customization is limited to a few company-designated settings. The most you can do is shift your folders and applications around — it makes you realize how brainless (or convenient?) the whole Apple process really is. After having my Android for a day, not only is my onscreen keyboard now Candy HD Pink, but I can also implement live widgets on the different pages of my device and shift them around to anywhere I’d like on my mobile desktop — much like a WordPress theme editor. Applications aren’t grid-locked or auto-sorted on Android screens, leaving you to be as creative as you want with your app placement. Also, everything feels surprisingly speedy and smooth. Being something of a social media geek, I elected to devote an entire page solely for social purposes. For example, on one page you’ll find a live-updating Facebook news stream widget, while below are app shortcuts leading to social networking services like Twitter, Google+ and Foursquare. 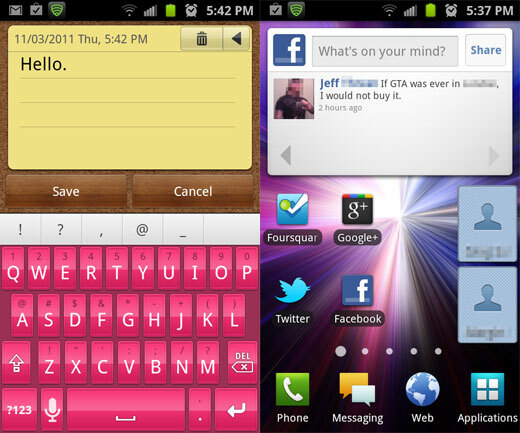 It’s also worth noting that while using these applications, my keyboard retains the Candy HD Pink theme I’ve installed to work across my device. You can pretty much do anything on this thing — the entire Android OS desktop is a playground for pure customization, and it’s actually a lot of fun. There are even certain apps you can install that completely change the stock user interface, allowing you to apply skins and themes to personalize your mobile experience. Go Launcher Ex, for example, changes the frames around your desktop app icons and completely redesigns the default app menu. Everything from text messages to email ringtone notifications etc can be toyed with until your phone is exactly the way you want it to be. I, of course, went as girly as possible with my own themes. Apologies if too much pink offends you. There was a definite learning curve to figuring all of this out, naturally, and I was seriously repulsed by how generic everything looked at first. When I received my Samsung Galaxy SII, I was still very much in the “Apple” mindset, expecting everything to be absolutely perfect and conveniently tricked out for me right out of the box. This is an OS that actually takes a bit of thinking, however, to personalize exactly to your liking. And after getting a bit of time to play around with it, I’m very much a fan. That isn’t to say that every app and program on the Android Marketplace is 100% terrific. Much like iOS apps, there are good ones and there are bad ones. It all just takes a bit of sorting through. Fortunately, I am the type of person who enjoys being able to personalize and custom-craft every aspect of anything I can get my hands on, so having the ability to more deeply toy with the various settings on the SII has been incredibly entertaining. At the touch of a button, I can switch from “girly mode” to a more professional theme that suits a more business-centric environment. What I mean is — it never gets boring. After being an iPhone owner for such a long time, it feels good to break out of the “Apple” shell. I definitely understand the Android perspective now. It’s not that it’s better or worse than Apple’s iOS — it’s such a completely different operating system that the two are hardly compatible. Each system offers different values and appeals to very different consumers. Android is interesting. It takes longer to mold, yes, but at least we can do some of the molding. Of course, these are merely first impressions from a brand new Android OS adoptee, and I’m still waiting on my iPhone 4S to arrive in a few weeks for comparisons. 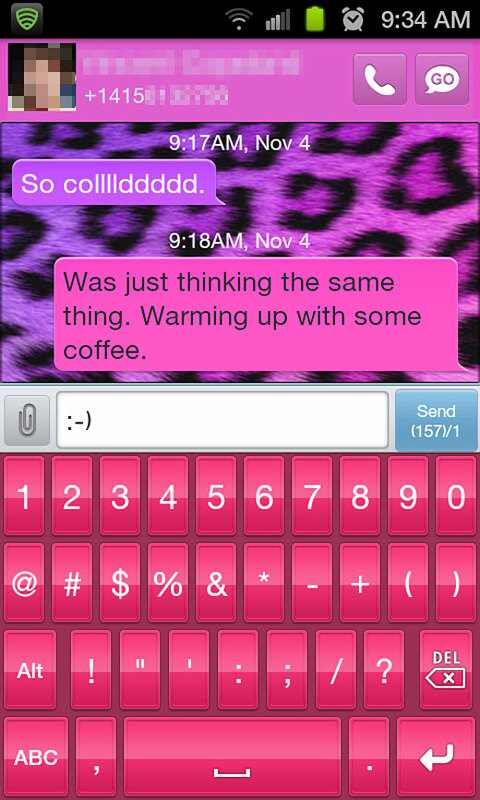 My mind could very well change. I’ve only had a day or so to play with this beauty, after all, and I’ve only listed some of the very cool features that the Samsung Galaxy SII has (and trust me, there are tons). It will be interesting to see how the 4S compares. That, however, is a story for another time. In the meantime, you tell me: What are some must-have applications for a new Android OS user? 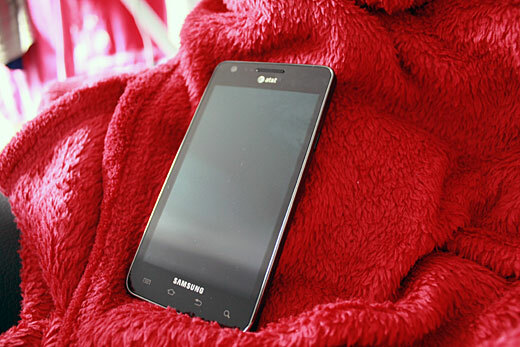 Do you have any suggestions for me on what I should do with my new Samsung Galaxy SII to get the most value out of it? Let me know in the comments below.